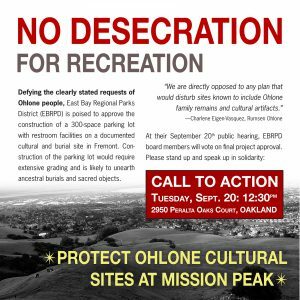 Let’s make it very clear to the board that the proposed project is unacceptable and the community is prepared to take additional action if necessary to ensure that Ohlone requests are honored. 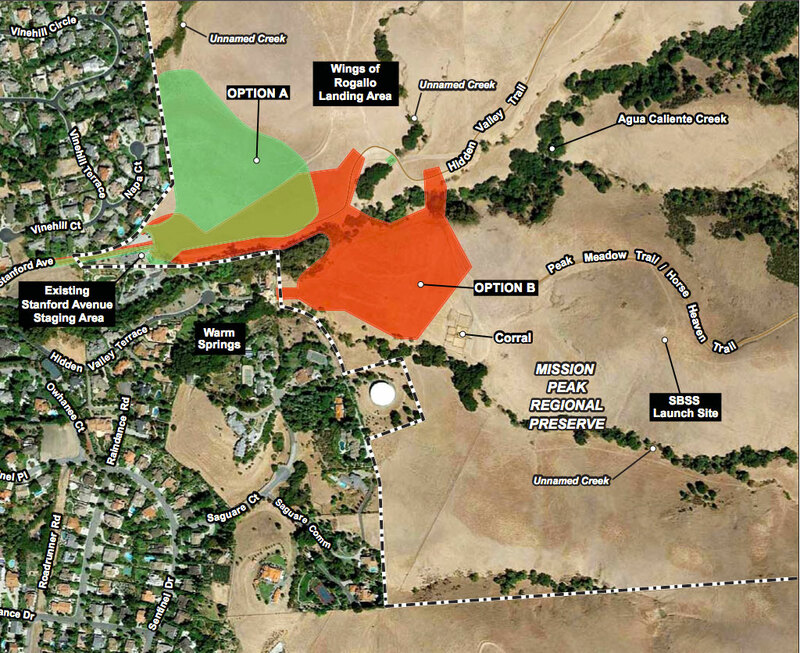 The Environmental Impact Report (EIR) for EBRPD’s Stanford Avenue Staging Area Expansion Project outlines two potential project locations— both are within the boundaries of a documented cultural site, along Agua Caliente Creek at the base of Mission Peak. The stated purpose of the project is to "better accommodate park visitor demand for trail access from the existing Stanford Avenue Staging Area at Mission Peak Regional Preserve." Mission Peak has seen a huge increase in trail usage in recent years, leading to an ongoing debate about the issue of parking. Although there is far more than ample parking in the surrounding neighborhoods and the parking lots of nearby Ohlone College, EBRPD is intent on expanding parking and facilities within Mission Peak Regional Preserve boundaries. EBRPD’s EIR acknowledges that "the project could have a potentially significant impact on Native American archaeological deposits and human remains," yet claims that proposed mitigation measures reduce these impacts to a "less-than-significant" level. These so-called mitigations consist of "data recovery" and consultation with Ohlone descendants to develop a "Treatment Plan" for how human remains and cultural artifacts will be handled once unearthed. Data recovery simply means that all cultural materials will be excavated, documented and analyzed by a certified archaeologist prior to the site being destroyed. "Data recovery, in consultation with members of the descendant community, provides a means of respecting Ohlone perspectives to the greatest degree possible while implementing the proposed project," the EIR states. At no point in this process do Ohlone people have the ability to stop or modify the project itself. 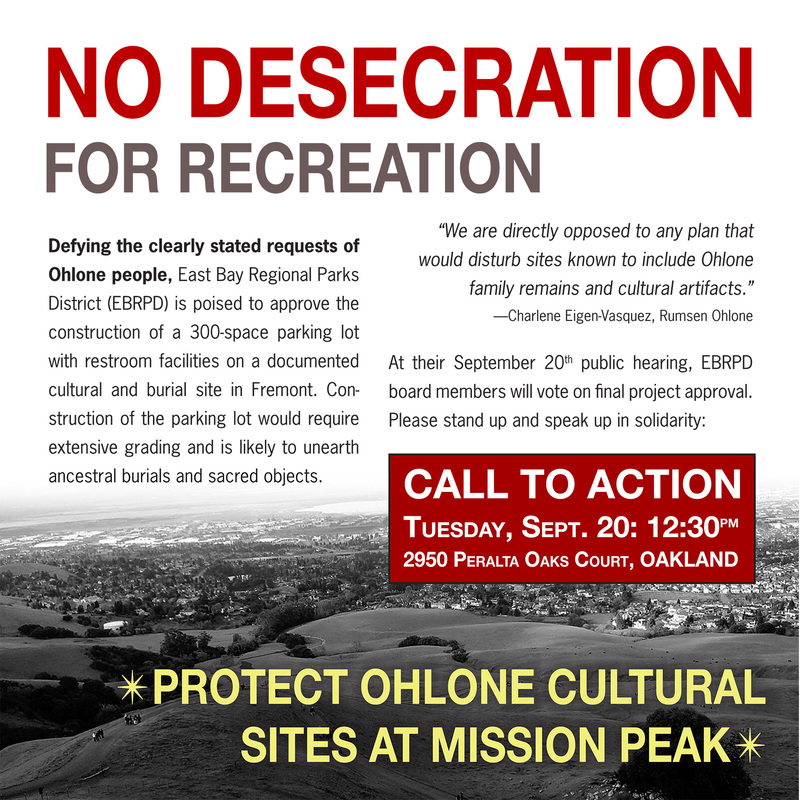 In other words, the only option provided to Ohlone people within this plan is to help oversee and facilitate the destruction of their own sacred site. Under the California Environmental Quality Act, preservation in place is the "preferred manner of mitigating impacts to archaeological sites," which sometimes entails capping sites with imported soils before construction occurs. In this case, EBRPD’s EIR states that "capping would not be feasible because the project site is not level and would require extensive grading and excavation (ground disturbance would result in approximately 12,000 cubic yards of cut, 2,000 cubic yards of which would be off-hauled)… Nor are any of the other methods of preservation in place feasible. The project could not feasibly be constructed so as avoid the historical resource CA-ALA-431 [the cultural site]. Similarly, incorporating the site of the historical resource within open space or placing the site under conservation easement would not achieve any of the project objectives and is thus also infeasible."